New for '14-'15! Submit all athletic forms online! Fort Bend ISD Athletics has purchased a new athletic software program so that we may better serve our athletes and their families. We are now using Rank One software. With this, all athletic forms will now be submitted online. When you submit the forms, they come straight to the Elkins trainer and are in the system under your athlete. The only paper form that will be required is the UIL physical/medical history form signed and stamped by the doctor. The Rank One online forms are now available. Click on the link below to access directions as well as the forms. Remember you will need the students name along with the student’s ID number to submit the forms. You may now begin submitting the forms for the 2014-2015 school year. Please do not wait until August to complete these forms. If you ever need to make changes to your athlete's Emergency Form, you can resubmit it to keep it updated. Seniors Playing Division 1 or 2 Sports Next Year: Be sure to send a final transcript to the college or Clearinghouse! Buy tickets online by May 8th to the May 12th Spring Athletic Banquet! The Spring Athletic Banquet is coming up fast! Brooks street BBQ has a delicious Chicken dinner to prepare for all of us! Absolutely NO tickets will be sold at the door, so we need you to go online to buy them. The event is May 12 6pm at the Elkins Commons! Buy your tickets and RSVP your meals! This form will be live until May 8. After this ticket sales will be CLOSED and there will be NO tickets sold at the door! See you there! 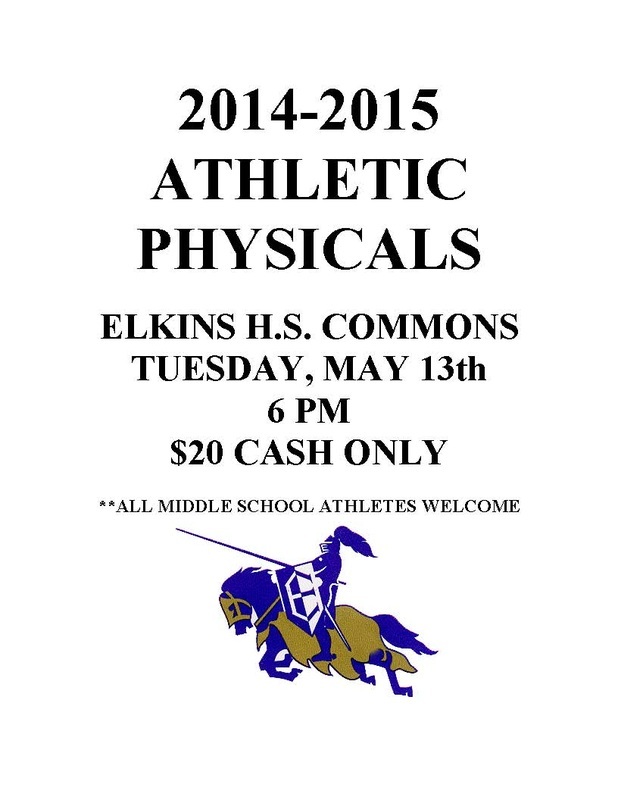 Complete your ‘14-’15 athletic physicals on Tuesday, May 13th @ 6 PM in the Elkins H.S. commons. $20 cash only. All middle school athletes welcome! 9th or 10th graders interested in being a student trainer next year, see Doc in the field house Friday or Monday a.m. Must be passing all classes! Congrats to Andrew Hopkins – FBISD’s first ever district champion in the para wheelchair event! Designed for student athletes ( football, basketball, soccer, track, volleyball, baseball and softball) and parents. 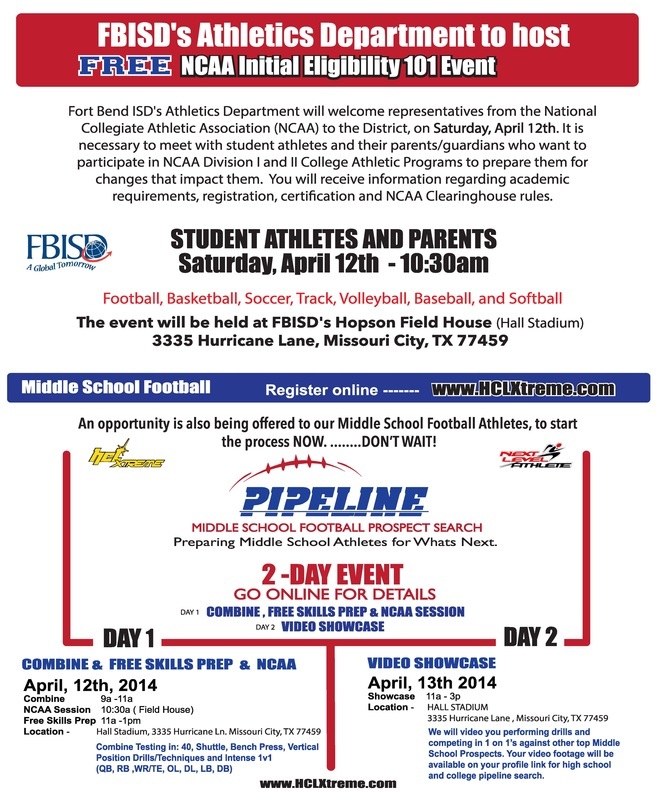 Fort Bend ISD's Athletics Department will welcome representatives from the National Collegiate Athletic Association (NCAA) to the District, on Saturday, April 12th. It is necessary to meet with student athletes and their parents/guardians who want to participate in NCAA Division I and II College Athletic Programs to prepare them for changes that impact them. You will receive information regarding academic requirements, registration, certification and NCAA Clearinghouse rules. Buy Elkins Spirit wear at lunch on Thursday, Friday, Monday and Tuesday -- March 20th through 25th. Fall Sports Banquet for volleyball, football & cross country will be Wed., January 22, in the commons @ 6pm. Purchase tickets during lunch. No tickets will be sold at the door.